Note: This shoe design does not match up well with bowlers who have "serious toe drag"
Own the lanes while wearing these White/Red/Black SST 8 bowling shoes! Ladies these shoes have interchangeable sliding and traction soles on both feet, so you can discover the perfect slide for your bowling style. This shoe design does not match up well with bowlers who have "serious toe drag"
I love the shoes....comfy right out of the box! Nice to have real leather so your feet don't sweat like most other bowling shoes that are made out of synthetic material. Would definitely recommend! I'm seriously considering buying a 2nd pr "just because". I have nothing negative to say about this shoe. I have very crooked & arthritic feet. It's very hard to find a shoe that will work for my condition. I'm also very hard to please. The minute I put these shoes on I could not believe it. I kept saying, oh my gosh, oh my gosh, it was unreal how they felt. They were very stiff at first, but after bowling a 3 game set on league they were instantly broke-in. I can't say enough good things about this shoe. Thanks Dexter for creating something that met all my needs, qualifications & expectations. I purchased the closeout version that has a slightly different sole. FINALLY wide width quality leather shoes and no more pinched toes from rental shoes. If you only buy quality leather shoes, then THESE are the shoes for you and they are worth every penny ! Loved them right out of the box. I bowled league night and then a weekend tournament. Not a single sore spot. If they weren't in such great shape I'd get another pair. I've only replaced one slide pad in almost three years. Worth every penny. Loved them right out of the box! My first pair of shoes I bought at Academy. They were the only choice of style in ladies and still we're uncomfortable. I bought these So worth the investment I bowled 18 games in a 4 days span without a rub or blister. Almost 3 years later they are still like new. I've only had to replace one slide pad. Love them. Hello! Toe drag is dragging the front of your foot on the ground during your follow-through instead of kicking it out behind you. At this time, this is the only color that is offered in womens. I had to get a brunswick leather shoe with interchangeable heel & solein a size 11 several years ago. 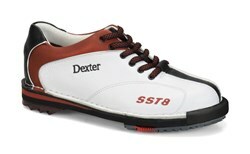 I was wondering how these dexter show sizes run. I normally wear a size 10 street shoe. According to customer reviews, this shoe will be true to size. Due to the time it takes to produce the Dexter Womens SST 8 LE White/Red/Black RH or LH Wide Width ball it will ship in immediately. We cannot ship this ball outside the United States.